FOR SALE Morso Chopper w/ extra set of blades $350 !!! Thread: Morso Chopper w/ extra set of blades $350 !!! Morso Chopper w/ extra set of blades $350 !!! Visit our online catalogs at: www.aimequipmentcompany.com & www.skylinepictures.com. Call us when you need Vnails, Saw Blades, and Tech Support. 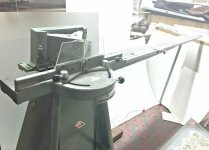 Re: Morso Chopper w/ extra set of blades $350 !! !